* Christian Floyd, White Oak H.S. * Brayden Vancil, Kilgore H.S. * Josey Darby, Harmony H.S. * Logan Littlejohn, Hallsville H.S. * Cade Judd, Union Grove H.S. * Kacee Gasper, Elysian Fields H.S. * Tomi Capps, Lindale H.S. * Ashleigh Sugg, Henderson H.S. * Wilson Nugent, Gilmer H.S. * Madeline Barber, Gilmer H.S. * Tom Smelley, Hallsville H.S. * Ryan Denton, White Oak H.S. The Harvest Festival and Livestock Show will provide scholarships for outstanding FFA or 4-H club members. The top scholarship winner will be awarded the 4-year Albert Horaney Memorial Scholarship. Officials of the Harvest Festival and Livestock Show will disburse the scholarship funds after completion of each semester and upon receipt of the college transcript for the semester completed. Scholarship winners may attend any accredited junior or four-year college. One vocational school scholarship will also be awarded. Harvest Festival Scholarship students are responsible for submitting their transcripts of twelve or more earned college credit hours (minimum 2.0 GPA cumulative) to receive scholarship funds for that semester. If student hours are under the minimum (i.e. 2.0 GPA) no scholarship funds will be distributed for that semester, to that student. Students must attend semesters consecutively or the scholarship will be forfeited. If there are extenuating circumstances, the student must contact the committee for approval. Payment requested for scholarship funds must be submitted on or before the beginning of the next semester, or funds will be forfeited. Copies of transcripts from previous semester must be received at Shannon Fell, 904 North Sixth Street, Longview, Texas 75601 before the funds will be distributed. For additional information on the two scholarships, CALL 903-236-8429. Select one of the applications below. Once open, go to File and then Download As to get the format you prefer. Applicant must have participated as an exhibitor at the Harvest Festival for a minimum of 2 years during his/her high school career. Only graduating seniors are eligible to apply. 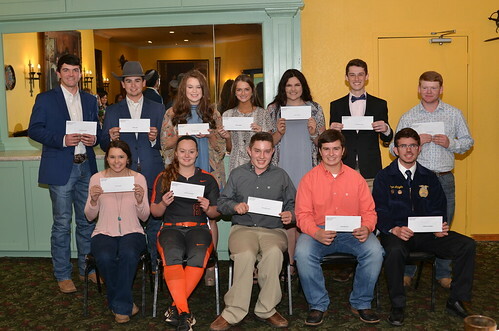 It will be mandatory that scholarship winners attend an accredited college/university (College Scholarship) or vocational/technical school (Vocational Scholarship) the fall semester immediately following his or her selection, unless special permission is granted by the Harvest Festival & Livestock Show Board of Directors. Qualifications will be based on need, scholarship, leadership, citizenship, participation in the Harvest Festival and project work. Applicant’s scholastic rating for the first 3 years of high school career should be high enough to place the applicant in the upper half of his or her class for the College Scholarship (not applicable to the Vocational Scholarship). High School transcripts signed by superintendent or principal must accompany application. Candidates must have taken the ACT or SAT and the official results must be attached to the application for the College Scholarship (not applicable to the Vocational Scholarship). Three letters of recommendation must be attached. A photograph of the applicant must accompany the application. Applications should be postmarked or hand delivered to Gregg County Extension Office, located at 405 East Marshall, Suite 101, Longview, Texas 75601, no later than March 1. Winners will be announced at the Harvest Festival and Livestock Show Crawfish Boil. Through the efforts of the Harvest Festival supporters, we award scholarships to area high school graduates. We will award as many scholarships as possible from the proceeds of sale animals donated back to the scholarship fund by the purchasers as well as profits from the annual crawfish boil. Mr. Albert Horaney was a life long supporter of 4-H and FFA youth in East Texas. He was a charter member of the Harvest Festival Board of Directors. Albert was a great supporter of the lamb shows, purchasing the champion each year, as well as many other projects.